I would never found this restaurant if it wasn’t for my neighbour, A. It was by chance that we met; we met one day at reception, I can’t exactly remember the exact details but it was the beginning of a beautiful friendship! She lives in my building, different floors, and ever since that day, we have been pretty good friends! I haven’t seen A for a while, so called her to see if she wanted to have lunch. She took me to Causeway Bay, the name of the street is Caroline Hill Road, it was somewhere I have not ventured too – actually I didn’t even know that street existed! There were many restaurants, ranging from western, to Japanese, to Taiwanese and local Hong Kong restaurant. We were originally going to have some western food, and I was glad that we both changed our minds when we saw this restaurant. For the life of me I don’t remember what it’s called, however, I do remember seeing the word ‘Taiwanese’ and ‘Kitchen’. I know that it is next to Mackie’s Kitchen, as we were going to eat there. There were many people queuing outside and many diners inside, so we knew we couldn’t exactly go wrong here! After waiting for about 10 mins, we were seated to our table and perused the menu. The menu was quite extensive, ranging from pork, beef and chicken dishes with rice or noodles. I ordered the pork chop with rice, cabbage, and scallion oil. When my meal arrived and placed in front of me, I was a little disappointed, as I was expecting a pork chop. 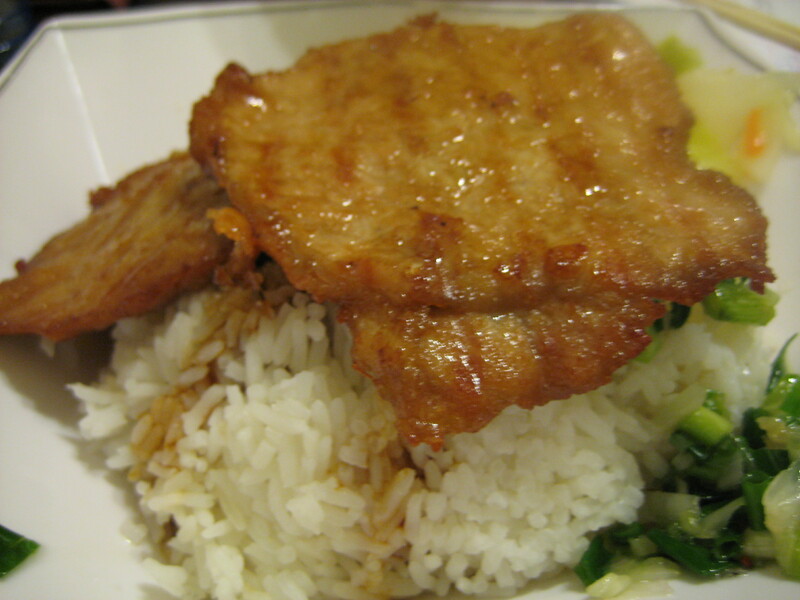 Instead, it was grilled pork breast. The pork was thin! Super thin, however, it was succulent, and the scallion oil, a great compliment and full of flavour. It was tasty but would have been better if it was pork chop or if it was thicker. 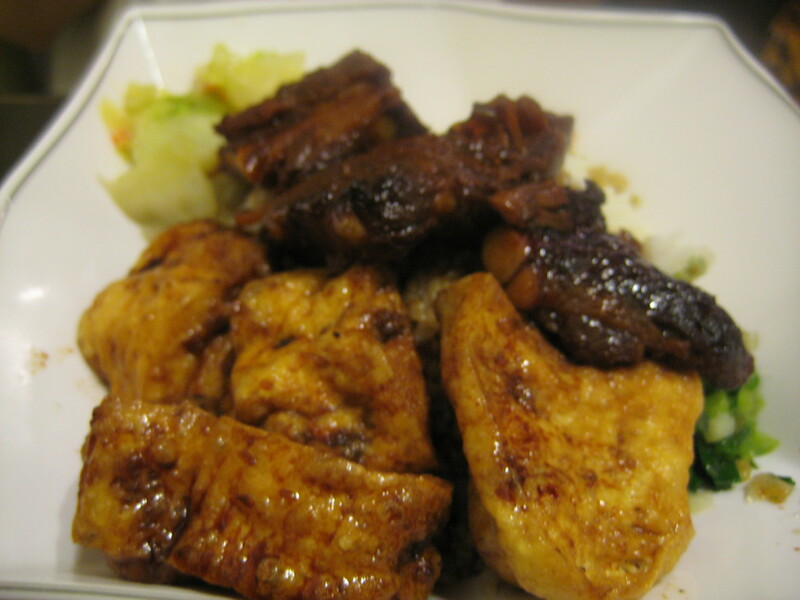 A ordered the pork ribs with tofu with cabbage and scallion oil and the pork ribs were tender and flavoursome. I really enjoyed the pork ribs more than the grilled pork breast. 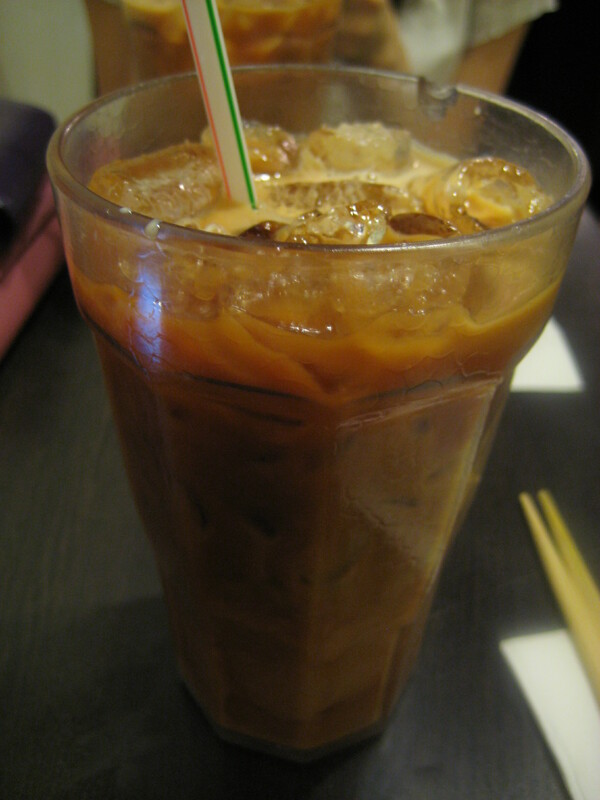 We both ordered a glass of cold Hong Kong milk tea, and I have to admit, although a little sweet for my liking, it is seriously one of the best drinks in the world. I could probably drink this all day, everyday, but definitely would not be good for the waist line or cholesterol for that matter! It was a great little place, extremely busy, especially during lunch peak hour! Service moderate, turnover extremely quick, and food fantastic! It was also great catching up with A, it’s definitely been a while. You would think we would run into each other every day, considering we live in the same building, alas, no. We do share the same common interest though…. FOOD!